Combine All The Fun of the Classic Board Game Clue with Halloween's Most Iconic Movie! Photo by: USAopoly, via Amazon. Love board games? Can't get enough Halloween fun fit into just one month? Well then it's your lucky day - USAopoly, the masterminds behind the countless niche variations on your favorite board games, has released a new game that's sure to have Halloween lovers thrilled - "Clue: Tim Burton's The Nightmare Before Christmas", which is available just in time for Halloween (or for Christmas, if you're planning goodies for the little ghosts and ghouls early, this year). The game, which is available on Amazon and from from toy retailers now (retailing at $39.99), centers around the mystery of who kidnapped the Sandy Claws? 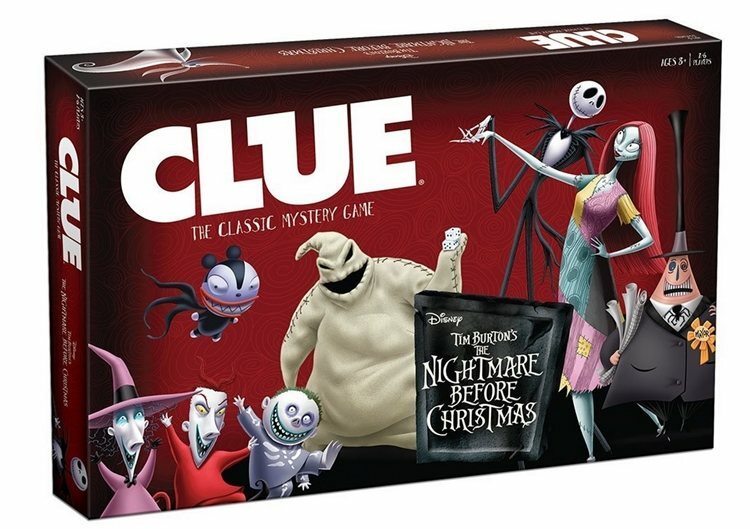 While the who, what, and how might be different, the general premise stays true to the original clue games - you need to figure out Who Kidnapped the Sandy Claws, What Item was Used To Kidnap Him, and Where Are They Hiding Him, just like you'd figure out the who/what/where murder scenario in the original Clue Board Game. The game can be played by up to 6 players, and there's even special instructions for playing with just two, so if you're having a quiet night in with that special someone, you can still scare up some fun playing this spooky adaptation of Clue. There are appearances from all of your favorite Nightmare Before Christmas characters, including Jack Skellington himself, Sally, The Mayor of Halloween Town, Oogie Boogie, Dr. Finkelstein, and of course the iconic trick or treating trio, Lock, Shock, and Barrel. Your mission is not only to figure out who kidnapped Sandy Claws and How, but to Save Christmas itself - this is quite the fun twist on the original game, and breathes new life into a classic board game while adding in a dash of Halloween fun. This game is a must-have for Halloween lovers who enjoy scaring up some old fashioned fun in the form of a board game. Have You Played Clue: Tim Burton's The Nightmare Before Christmas? Let Us Know Your Thoughts on the Game in the Comments Below!